It’s that time of year when you’re getting ready to down tools and leave the office for the festive period. The problem is that with smartphone and mobile communication being so embedded in our working lives it can be quite difficult to switch off over the holidays. There are ways that you can manage your phone calls and emails so that you can set communication levels and only allow the important items to reach you. 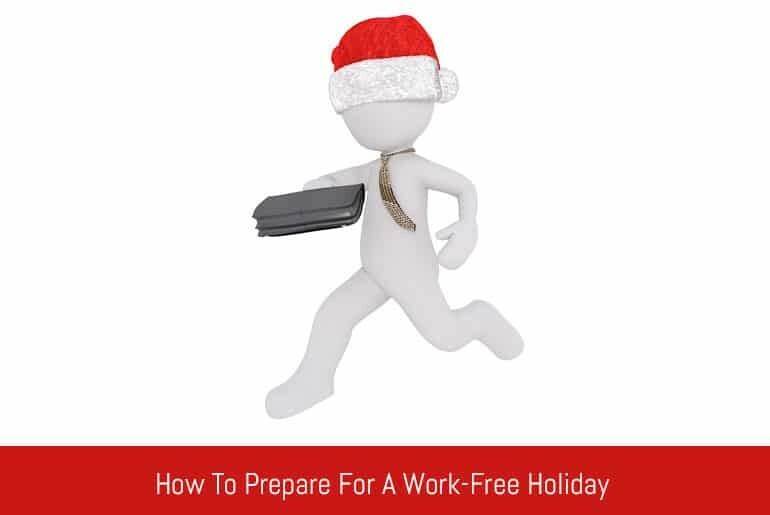 In this article we look at a few ways you can prepare yourself for the holidays and have a system in place to (hopefully) make your break stress-free and reasonably free of workplace interruptions. Don’t over-complicate things. You need to make sure that your system is simple to implement and maintain. If it’s a complex system then there’s more chance of a point of failure, or that you’ll be less likely to use it correctly. It’s important that your system can handle 10 emails or 100 emails, how many voicemails will your phone hold before you have to start deleting something? Try to think of the worst case scenario for the amount of communication you’ll get and set your system to that level. We’re not talking about a hacker-proof system (although that should certainly be a consideration), you need to feel secure that your system is going to work and that nothing will fall through the cracks or you’ll be checking your emails every 5 minutes which defeats the point of the exercise. Think about the routes of communication you will be receiving and then work around them, there’s no point building a robust voicemail system if 99% of your contact is through email. Once you’ve looked at the communication channels (emails, phone, social media etc.) you can start to put a system in place to prioritize contact through each of these mediums. For example, you may decide that all urgent requests should be phoned through to your work mobile. The problem is that everyone thinks that their request is super-urgent so you need to set up some ground rules in order to stop your phone ringing off the hook. How do we do this? By managing the contact’s expectations. In any autoresponder or voicemail, let them know what dates you will be out of the office, when you’ll be returning, how often you will be checking your messages during this period, and what your estimated response time will be for non-urgent enquiries. Give them an alternate point of contact for urgent enquiries – a different phone number or email address would be great for this as it enables you to separate standard from urgent enquiries. Explicitly state what constitutes an urgent enquiry – server failure, PR disaster etc. and let them know how to contact you, and stress that it’s only in these circumstances. The majority of people should be happy knowing that their request has been received and will be dealt with by a set date. If you’ve said that you can’t accept calls but will respond to voicemails left on the “urgent” phone number with 3 hours, make sure you check your messages every 3 hours. If a customer has waited 5 hours to hear back from you, they’ll start calling you repeatedly or may even try to contact someone else in your organisation which will ruin their holiday. You have set expectations in your autoresponder so it’s important that you meet them in order to ensure your process runs smoothly and you keep your customers happy. We have all dealt with clients that, no matter how hard you try or what the circumstances are, are never happy. Have a plan in place to deal with the complaints – but make sure this is used only as a last resort, your boss needs a break too! So, before you close your email down the last time for a week or two, set up an auto-responder, clear your inbox the best you can, set filters to get all of the junk mail out of your inbox, delete old voicemail messages, set your new voicemail and call your most important clients to let them know you’ll be away and how your contact process will work. And, most importantly, Have a Merry Christmas and A Productive 2018!